Last night, I was talking to a friend who was about the same age as I and was also loveless. We were discussing how it seems that we attract the young ones and the married ones, both not really what we want in life. As we were discussing, I realized that as much as yes I would like to have someone at my side, I don't really need someone. I realized that as much as I kept looking for love before because I believed that it was part of what would make me happy, I now have learned to create my own happiness and it was more habit that I yearn for love than a real need for it. Almost two years since I stopped looking for my happiness, I have learned to create my own happiness. I create my own happiness when I sing because I can express my emotions through singing. 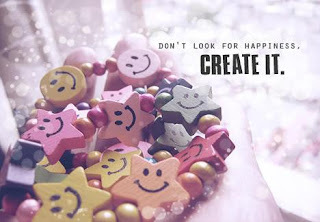 I create my own happiness when I blog because I am able to write down my thoughts and look back on it later on. I create my own happiness when I capture photos of places, events, food, and most of all, people that I love. I create my own happiness when I immerse myself in the theatre because I can get lost for an hour or two in the lives of others. I create my own happiness when I scrapbook because I know that years from now, other generations of my family will see the beauty of our lives. I create my own happiness when I am able to prove my worth at work. I create my own happiness when I am able to provide for my son's needs financially and spend time with him by teaching him epic fail paper planes. I create my own happiness when I bond with my family. Most of all, I create my own happiness when I am by myself, with my iPOD blasting, sitting in a coffee shop, reading a good book. Finally, after almost 2 years, I can now honestly, truly say that I am happy on my own and that I have learned to create and mold my own happiness. Shake up! Shake up to happiness coz something beautiful is always waiting for you. Wake up! wake up to happiness because it's you yourself possesses it. Bring out! bring out your happiness! Whew..napapakanta ako sa'yo Kay...infectious ang happiness mo. Definitely 2012 is your year I guess, so just stream down to the flow of the river of happiness in you. Cheers! Sometimes happiness is right under our nose, but we fail to see it because we think it's out there. Happiness is a choice. It's there when we're ready to see. Happiness is indeed based on a person's control. If they want it, they make it happen. Happiness is a state of mind. Thanks for reminding me to stay happy. Have a good one! one of the things that i remember vividly was reading a quote from the dalai lama -- "It is very important to generate a good attitude, a good heart, as much as possible. From this, happiness in both the short term and the long term for both yourself and others will come".